The sky is blue. That much we can agree on. Or can we? I mean, where I reside in San Francisco, it’s typically an ominous shade of grey (because, fog). In the clever new platformer Hue, from Fiddlesticks Games, the sky doesn’t have to be blue. Not always at least. The sky can be crimson red, fuchsia, purple, orange, lime green, and a couple of other tones. And it’s necessary to change—that’s at the heart of this game’s challenge. As you trek through its base-grey world, you must manipulate the sky to different colors to make various objects both appear and disappear to progress. In the game you play as a small boy aptly named Hue. His white beady eyes peak out of the equally bleak and sometimes-technicolored world. He’s plagued to remain within this hauntingly default-grey universe. A world that’s full of terrors at every corner, where grim death animations of hopping into spikes resemble those of the desaturated Limbo (2010). All along his journey, Hue busily collects color fragments, aiding him in his quest to find his long lost mother (who has left behind saddening audio diaries about her ill-fated research and her raising of Hue away from society and the University she once worked). Hue eases you into its puzzles, with only a couple of colors at your disposal. As the game moves onward and more shades join your wheel, the puzzles ramp up in difficulty. Before I knew it, I’d find myself sitting on a plane, hand stroking my chin, as I tried to plan my way through a particular screen. The puzzles in Hue are the perfect balance of difficult; sometimes dependent on timing, others on pure strategy, sometimes even both. I hardly found myself coasting through sections, nor tossing my controller in frustration and mumbling obscenities to a non-existent higher power. Figuring out the color-addled portions is part of the joy to be had in Hue. While color is used in Hue to solve puzzles, it also evokes a mood. Specifically in the quieter sections of the game, soundtracked merely by Hue’s mom’s monologues. Each new color added to Hue’s color wheel represents a new mood for his narrating mother, like red fostering her anger. 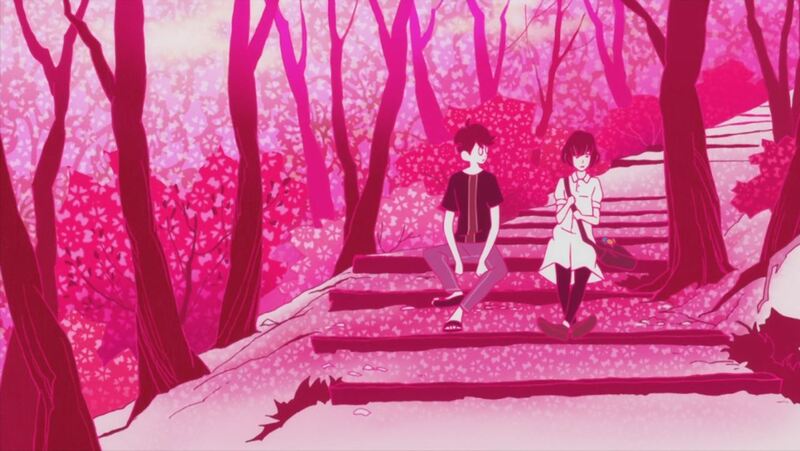 In Masaaki Yuasa’s award-winning, sorta time travel-oriented anime The Tatami Galaxy (2010), color is also used as an indicator for different moments and emotions in life, as the protagonist pursues his coveted “rose-colored campus life.” When color filters over a scene, it’s likely to include his evasive love interest Akashi. Some scenes are blanketed in a shade of cherry blossom pink, others in a sublime yellow or green. 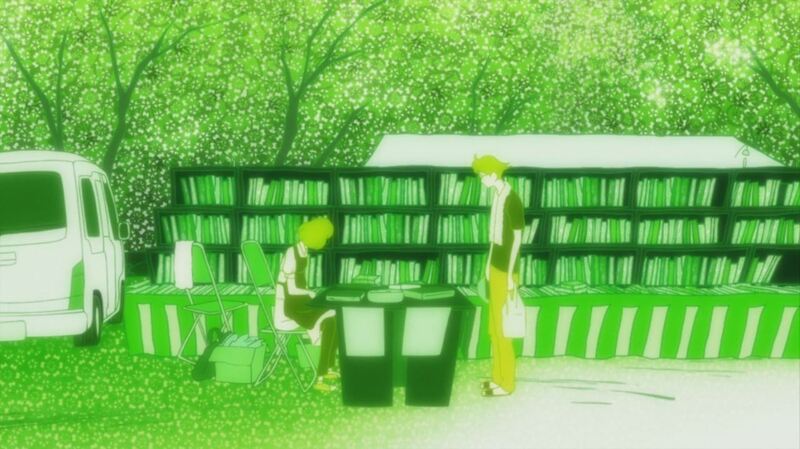 Colors represent the different ways the protagonist’s friendship with Akashi exists—and how it’s manifested in different ways over the many parallel lived-in realities he experiences over the course of the show. 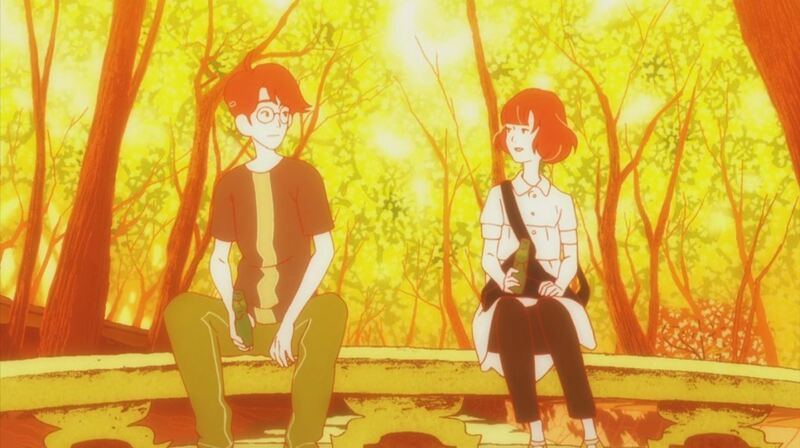 Hue has made me enjoy color in ways I haven’t in recent times, kind of in the same way that watching The Tatami Galaxy made me take a step back from my isolating lifestyle and try to enjoy life. Back when I was art director for my measly university’s magazine, I obsessed over hues and complements, making sure all colors were perfect in our pages at all times. In Hue, color isn’t just the center of a challenge, it presents a new way to see the world at hand. A new way to experience the colors in both our virtual and everyday lives. Who knows, maybe I’ll go outside today just before sundown. Perhaps the sky will be a light mixture of pink and orange, rather than the grey I’m used to. There won’t be any puzzles at my disposal, but that’s okay, the color will enough to see. Beyond just another glowing computer screen. Explore the saturated world of Hue for yourself. It’s available now on Windows, Mac, PS4, and Xbox One for $14.99. It’s also coming to PS Vita… eventually. And if you’re colorblind, fear not! Luckily there’s a togglable colorblind option, in which symbols appear over their corresponding color.